No matter where you go in India, Upma is a hot favorite breakfast food! Originally from South India, this tasty dish can be eaten for breakfast, brunch or as a snack and is so wholesome you can even make a meal of it! Vermicelli Upma is a delicious and nutritious low cal breakfast item which can also be enjoyed as snack or packed lunch. The vermicelli or semiya are roasted and then cooked with onion, mustard seeds and chillies. 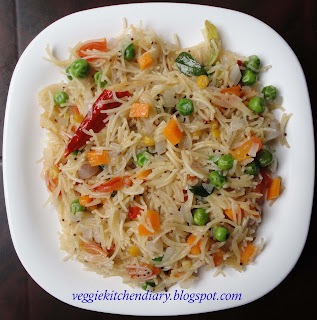 Try my easy recipe for Upma made with Semiya or vermicelli. ! 1.Heat a frying pan on a medium flame and add 1tsp of ghee. Roast the vermicelli lightly in the ghee till it turns a pale golden brown. Stir frequently. Once done, remove from the stove and keep aside. 2.Heat the oil in a pan and add the mustard seeds channadal,urad dal, curry leaves,red Chillies and hing. When the spluttering stops, add the grated ginger and stir well. Cook for 1 minute. 3.Add the onion and fry till translucent and soft. 4.Add the the mixed vegetables like carrot, peas and tomatoes and cook till soft. 5.Add the 2 1/2 cups of water and salt to taste and bring to a boil. 6.Add the roasted vermicelli, a little at a time, stirring constantly so that it doesn't clump. Let it cook in the open pan until the vermicelli has cooked all over and there's no water left. 7.Garnish with chopped coriander and serve piping hot.